Up to ₹50 Lacs Buyer Surety. T&C Applied. 1-Year Road Side Assistance T&C Applied. Please wait while your report is getting generated Email has been sent to your email id. Email has been sent to your email id. Please choose nearby location to buy this vehicle. Thank you! Your bid has been submitted. If you are the winner, you will be notified by e-mail, sms and on your Droom account. You are almost there! We just need some basic information from you. 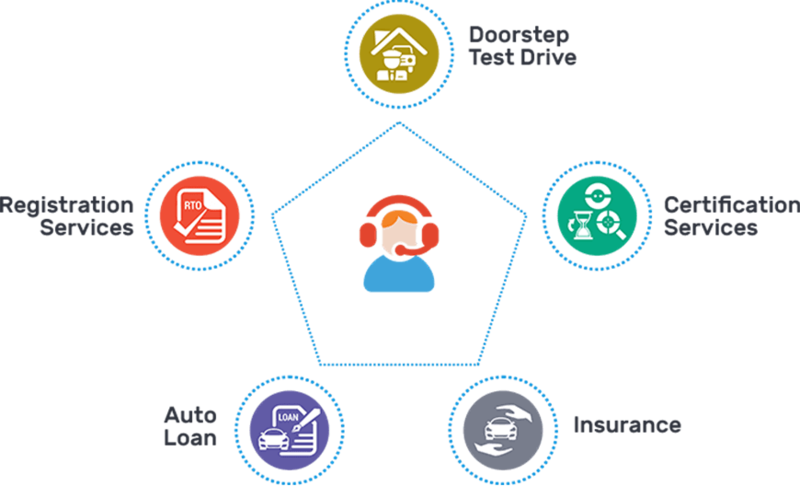 Doorstep Test Drive is available on this listing. Would you like to get Doorstep test drive of this vechicle? Please enter your pincode * Checking Please Wait.... Location available, please go ahead. No Need To Apply Code. The offer shall only be applicable on single order per registered user. Droom reserves the right to ask for more information before processing the buyer’s order. This offer/deal can end anytime without any prior notice by Droom. Buyer is solely responsible of reaching out to seller and coordinating the transaction closure process. Buyer and sellers are responsible for following all the rules and regulations prescribed by RTO for buying, selling, transfer and registration of the vehicles bought from the Droom platform. Previous vehicle buyers under promotional offers on Droom will be subject to inquiry and will be barred from availing offers on any other vehicle(s). Droom will not approve any transactions unless the buyer goes through Droom's buyer verification process and Droom deserves the right to cancel any transactions in case any malpractice is found. The seller offer(s)/deal(s) is being made at the sole discretion of the seller and can be withdrawn / end anytime at the discretion of the seller, with or without prior notice. 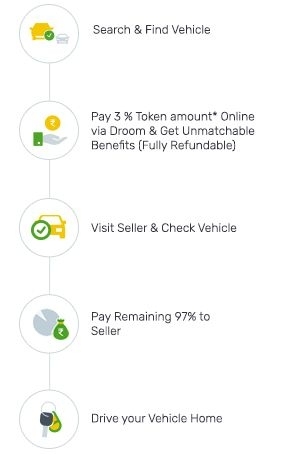 Droom does not assume and undertakes any liability towards availability of the offer(s) and the buyer acknowledges the same by availing the offer(s). Buyer is solely responsible for reaching out to the seller and availing the offer(s) provided by the seller and Droom will have no role to play in the said offer(s). Droom will not be responsible for the fulfilment/delivery of the offer(s) provided by the seller to the buyer at any stage of the transaction. It is the sole responsibility of the seller in case of non-provision/non-availability of the offer(s) displayed on the website and Droom will not be liable in any manner for the said non-provision/non-availability. In case of any issue, Droom’s decision shall be final and binding on the buyer. Some Great Offerings Only For You! How would the Services be Delivered? Here is a great opportunity for you to apply for loan for the above token amount! Any running EMIs (in Rs) ? How Much Do You Earn Annually (in Rs.)? You need to pay 1.5% of Token Amount as Processing Fee (non-refundable), whether you buy the vehicle or not. You are approved for ₹1 lakh of credit limit! I agree to Terms & Conditions Terms & Conditions of the loan agreement are subject to change, depending on the evaluation of your application performed by the lending partner. Get Peace of Mind, No Negative Surprises! 60, 90 days & lifetime transaction details and more..
check vehicle Loan history and more.. Estimated cost of repairs and more.. Need more surety and trust? Avoid Risk from unknowns with FCTS report. 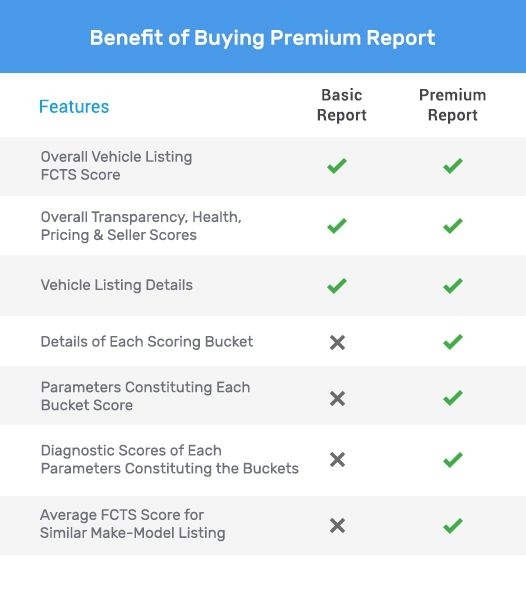 Know all about FCTS components and their scores comprising the transparency score, health score, pricing score and seller score. 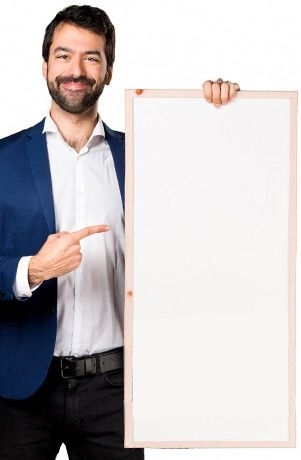 You will be redirected to Droom Credit for your loan application. We have sent an OTP to your registered email id for verification and signing into your Droom Credit account. 1.Prices shown may vary with change in government rules and regulations. 2.Price is susceptible to technological disruptions in the industry. 3.Discontinuation/New Model launches may influence the price of the vehicles. 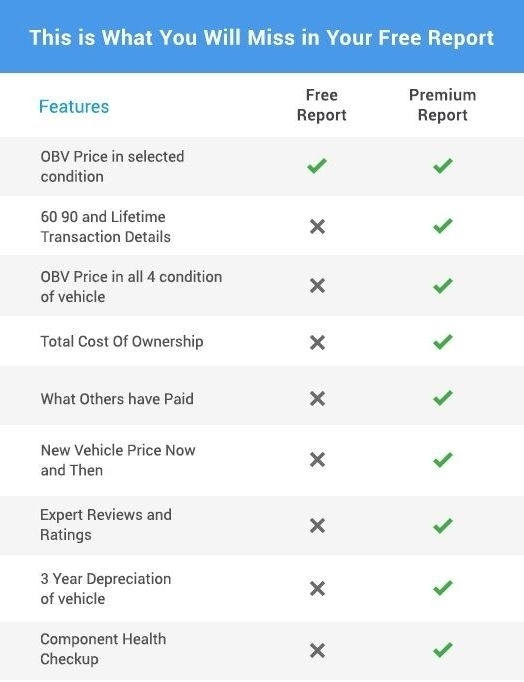 4.The actual condition of the vehicle at time of sale will impact the price. 5.Prices shown may vary with change/modification/upgradation in the features of OBV website & app. 6.Droom disclaims all liabilities in relation to the use of, or otherwise in connection with, the prices shown on OBV website & app. Droom will not take responsibility of any transaction that takes place by relying on the prices shown. 8.All disputes shall lie within the jurisdiction of the courts of New Delhi only. Field is required. Please enter valid First Name. Field is required. Please enter valid Last Name. Field is required. Please enter valid 6 digit Pincode. Field is required. Please enter valid Phone Number. Select Yes No In Process Filed IT Return last year?